Slegest came into life when "Vreid" guitarist, Ese, left in 2010 after featuring on four albums. For Slegest, Ese wanted to use his inspiration from Black Sabbath and combine this with harsh vocals. This resulted in a special blend of classic heavy rock and old-school black metal elements, creating a dark and sinister sound combined with lots of groove. 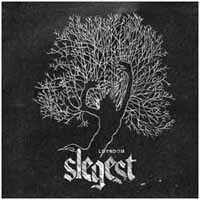 The self-titled Slegest debut EP was released in 2012 and got very good feedback from the metal scene. Shortly thereafter Ese started the work on his debut album, and now “Loyndom” is ready to be released. With “Loyndom” Slegest takes its original sound a step further, without losing any of the dirtiness or catchy groove. Apart from playing all the instruments (except a guest solo from his former band mate Sture), Ese also recorded and mixed most of the album at his Systrond Studio together with some parts at Conclave & Earshot Studio with Bjornar E. Nilsen. The album is mastered by Herbrand Larsen (Enslaved). Ese has now put together a live band, and will be seen at festivals in the near future. The Slegest combination of heavy and classic hard rock with old-school mid-paced black metal is a crushing experience, and fans of heavy and groovy extreme metal won’t be disappointed.